As cycling continues to grow in Kelowna so does our network of bikeways. There are nearly 300 kilometres of on-street bicycle lanes and 40 kms of separated paved multi-use paths. 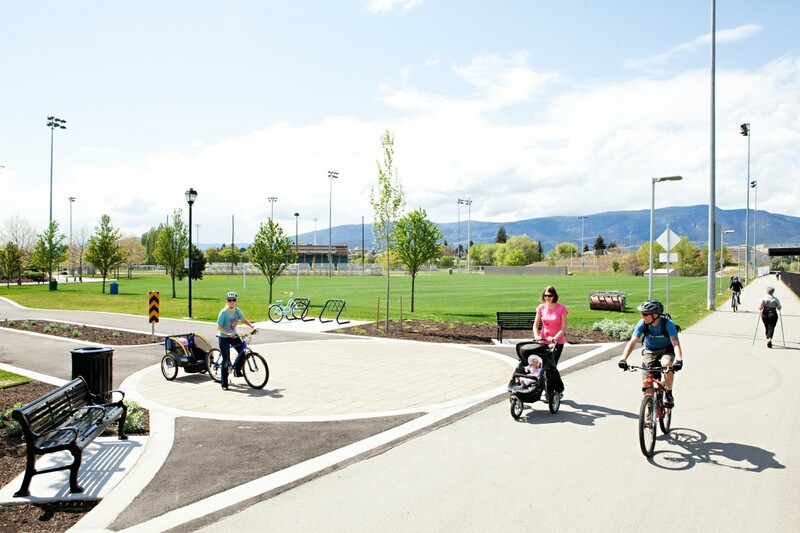 Kelowna's Rails with Trails pathway is one example of a paved multi-use pathway that provides a safe, accessible route for cyclists. To plan your route use our Bike Map or Google "Bike Routes". We offer a Bicycle Route Map with details of bicycle lanes, suggested bicycle routes, and pathways within the city of Kelowna. Kelowna's Bicycle Route Map can be printed, or pick up your copy at your local bike shop or City Hall. Kelowna was one of six Canadian cities to go live with Google Bike Routes in December 2010. Google’s cycling trip planner does not indicate current bikeway/streetway conditions therefore always use caution and/or confirm your chosen route is suitable for your skill/experience level. Consider using Google Streetview to view routes, confirm your route against the City of Kelowna’s bike network map and/or review your route with someone who has experience with the local bikeway and roadway network. Access the RCMP website to register your bicycle for free. Report a bike lane that requires maintenance.